For our collection, we liked Lot 158, the vintage Berenice Abbott, Broome Street, New York, 1940, but there were also a pair each of Sugimoto theaters and dioramas that caught our eye, even though they don't fit into our genres. At some point soon, I imagine the sale catalog will find its way to the Internet, and will be found at the link below. Comments/Context: Since there are plenty of sites and blogs that do an excellent job of exposing the work of new and emerging photographers, we typically don't consider weighing in on unrepresented photographers as part of our mandate here; in general, most collectors aren't focused on artists without a gallery to stand behind them. But to every rule, there must be an exception, and I was recently introduced to this series from Gabriel Benaim, and I found it compelling enough to consider for our own collection. Benaim's images of Tel Aviv, Israel, make dense patterns of the lines and forms discovered throughout the city. 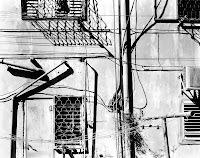 Urban geometries and abstractions are created from railroads and highways, beachfronts and sidewalks, scaffolding and telephone poles; his compositions are careful and layered. Often Benaim looks down from an elevated perch, taking in the sinuous curves of a parking garage or a roundabout or using the view from a rooftop to flatten out the picture plane. This work has plenty of precedents in the history of photography: there are strong echoes of Callahan, Friedlander, and the New Topographics photographers. (Ha Yarkon Park, 2008, at right.) But rather than seeing these works as derivative knock-offs of decades old masters, I saw this series as an exercise in drawing on the lessons of the past and applying them in synthesized ways to new subject matter. Tel Aviv is a modern urban sprawl, blasted by punishing sun, where the awareness of conflict and violence that engulfs all of Israel constantly simmers under the surface. In some sense, the land and its history provide a surprisingly different mindset for looking at these pictures: knowing these images are of Tel Aviv, the Modernist architecture and perfectly planned waterfront boardwalks seem more earnest, and the satellite dishes that pepper the city rooftops seem more vital as a crucial link to the outside world. There is an evident newness to Benaim's view of the city, an aspirational optimism and defiant spirit that is somehow different and less overtly critical than the American photography tradition he is drawing on. I'm looking forward to seeing where this series goes as Benaim continues the project. For those of you who think black and white city photography is "stuck in the 1970s", I think these images strike a good balance between reflecting on the old and showing us the new. Collector's POV: At this point, Gabriel Benaim is an unrepresented photographer. He is selling the images from this series directly to collectors; prices range between $900 and $1500 depending on the place in the edition. Given that city and industrial abstractions are one of our three collecting genres, these images would fit quite well into our world: they relate effectively to other works we already have on the wall, but offer new perspectives that provide intriguing contrasts and comparisons. We're off for our last week of family summer vacation. There will be no new posts until Monday, August 31st. As always, a break is a good opportunity to dig through the archives and revisit posts you've missed, to make that comment you've been meaning to make, or to tell someone else about what we're doing here. Come September, the New York photography world will wake up from its slumber and jump back into full swing, so take a deep breath and get ready for a flood of new shows and auctions. Comments/Context: In recent years, the blur seems to be making a comeback as credible photographic technique. Generally scorned as the result of a photographer's mistake or ridiculed as too art school self-conscious, in the past decade or so, both Thomas Ruff (nudes and JPEGs) and Hiroshi Sugimoto (architecture) have successfully reintroduced the blur as a conceptual exercise in questioning the nature of seeing and perception. German photographer Stefan Heyne combines the use of blurring with an interest in fragmented abstraction, creating fuzzy images of often unidentifiable colored surfaces and forms. The best of the works in this book recede into unrecognizable shadowy constructions, reminiscent of Rothko's color fields and Newman's zips. In many ways, his works are a rejection of the tyranny of sharpness that dominates the medium; the pictures are not about truth or reality, but about amorphous ambiguity, where real things are reduced to humming angles and stripes. In some of the images, the object being photographed is too easily identified, and a bit of the spell is broken by your mind saying "it's a boat". But for those perplexing pictures where there is no obvious answer to what is being shown, the simplicity of the abstraction takes over and the compositions are much stronger. 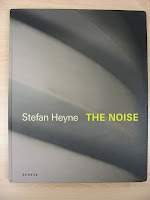 What I like about Heyne's approach is that he is pushing the boundaries of the medium in novel ways, trying a different path than nearly everyone else around him. He doesn't always succeed in making a memorable picture (who does? ), but I like the fact that he's out there on the knife edge, taking some risks and going against the grain. Collector’s POV: Stefan Heyne is represented by Kaune Sudendorf Cologne (here). His works range in price from approximately $6000 to $14500. His images are mounted on aludibond and covered with a protective film, and come in editions of 3 or 5. Heyne provided me with the image at right, an installation shot from one of his recent shows. You can see from the picture that the works are generally large and have an object quality to them (in contrast to a traditional matted photographic look). This makes them a poor fit for our own collection, but they would likely interact well with other sleek contemporary photography. While we've been collecting for quite a few years now, it wasn't so long ago that I have forgotten what it was like when we made our first purchases. I remember the process to be a heady mix of excitement and uncertainty, with a strong undercurrent of trying not to make a mistake; the truth is, it's still a little like that. Many gallery owners, especially in this environment, seem fixated on how to attract entry level and new collectors. Surprisingly, they often think that low prices and "deals" will make all the difference. While price certainly matters, I think this strategy is generally misguided. What collectors need, especially new and inexperienced ones, is information and education to settle their nerves. Only when a buyer feels comfortable will his/her wallet open. I was therefore pleased to hear about a new set of lectures being put on this fall by the Catherine Edelman Gallery in Chicago (here). For $100 (and if you're not willing to invest $100 in your photography education you have no business calling yourself a collector), the In Focus series (here) takes place on four Saturday mornings and covers a wide range of practical topics, with input from the gallery staff and outside experts (collectors, critics, professors, etc.). Even as an experienced collector, if I lived in Chicago, I'd be tempted to attend these discussions, mostly to hear how Edelman and the others view the current market and its opportunities. And of course, we never get tired to talking about photography. The trick is of course to get people to show up. So Chicagoland readers, make an effort to support this lecture series, as it's the kind of thing we need to see more of. And for New York area galleries, this is a great example of a low cost/low impact way to invest in your client base to build sales down the road. In the slow days of summer (no auctions, few new gallery and museum shows of note), I've been spending some time gearing up for the Fall and thinking about how to make what we're doing here more useful and comprehensive. Regular readers will know that we have been particularly concerned with the woeful state of available reviews for gallery shows (related post here); many, many people have shared their concerns over this reality. The most common answer to the problem is that we as collectors need to step up and fill the void being left by the disappearance of the traditional media. In a perfect world, we would like to significantly increase our coverage of gallery shows, so that we get out to the edges a bit more, rather than simply covering the mainstream offerings of the most obvious photography galleries; my crazy dream is to double the number of gallery shows we review in a year. While we feel like we have a decent handle on the New York scene, gallery shows in other places around the world are getting zero attention here. I'd like to change that in the coming year. Will this idea open a can of worms that is hard to control? I hope not, and so I've come up with a few guidelines to help guide the effort. The primary and most important criteria is that the reviewer be a serious (and knowledgeable) photography collector. No exceptions. Second, the contributed reviews need to come in our standard format: installation pictures (if available), exhibit facts, commentary/criticism, prices and collector favorites, rating (using the same system/criteria we use), and useful transit links; we want the reviews to look and feel exactly like our own reviews (I can provide a little cheat sheet of questions that need answers that we use when visiting a show if it would be helpful). Third, all reviews would be published anonymously, so collectors can feel safe in truth telling; while a few collectors might potentially feel comfortable reviewing under their own real byline, there will be no exceptions to the anonymity rule. Last, and perhaps most obviously, we require a high standard of professionalism and integrity in all the reviews we will publish; no jackass, poorly written flames or diatribes will ever find their way onto this site. Before you rush off to start reviewing the shows in your local galleries, please email me first at info@dlkcollection.com so we can discuss whether the show is already being reviewed by someone else and/or is a good fit for this site. I'd like to get to the point that we have at least one solid contributed review each week, so that we can all get a broader picture for what is happening in photography worldwide. At some level, we will act as editor and perform some quality control to ensure some consistency, but in the end, the writers will be the ones that have seen the shows first hand, so we will err on the side of trusting their judgment, whether we "like" their conclusions or not. The goal here is to develop a broad and deep net that catches as much as possible of what is happening in the grassroots photography gallery world today; a big audacious goal I realize. We can only do it with the help of other like minded collectors. But if you find yourself in one of our target cities (or elsewhere for that matter), please think about taking the time to contribute a review for a show that you were already planning to visit anyway. The rest of us will certainly benefit from your generosity, and I can say from experience, it will sharpen your experience of seeing the work on view and surprisingly might actually be fun. Comments/Context: In our specific collecting genres, we tend to search far and wide for images that might be a match for our collection (regardless of how well known the photographer might be), and over the years, we have run across a few florals and nudes by the French photographer Emmanuel Sougez that seem to fit into our general aesthetic approach. I recently came across this book, and even though it is in French (and my college French is pretty rusty) and since we didn't have anything on the artist in our library, I thought it would be worth adding as reference. Sougez was active between the wars, and had an affinity for straight photography, similar in concept to the New Objectivity in Germany or the f.64 group in America; as such his images make a good foil for work from both of these movements. This volume is filled with crisp table top still lifes of bottles, glassware, linens, feathers, fruit, and the like, interspersed with simple nudes emphasizing curves of form. A few portraits are also included, often dominated by the line of the subject's arms. Seeing more of Sougez' work collected in one place (via this book), I have come away generally impressed with his overall output. His low profile makes him one of the more under appreciated photographers from this artistically active period. Collector’s POV: Artnet doesn't list any dealers who represent or have inventory for Emmanuel Sougez. I Photo Central (here) has a few images, although they are not particularly representative of his work. 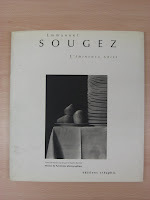 At auction, Sougez prints have been available from time to time in the past few years and have typically fetched between $3000 and $20000. For our particular collection, one of his nudes or floral still lifes from the early 1930s would be a good fit. Comments/Context: The photography of Pierre Dubreuil has always seemed to me to be the terrain of experts and connoisseurs. Until I ran across this thin exhibition catalog at the Strand recently, I had never seen anything written about him; this may be the only book on him that is readily available. My only real experience with his work has come at auction previews, where I have seen a few of his exquisite prints and marvelled at (and been somewhat perplexed by) their sky high prices. Dubreuil was a lesser known French photographer who made a relatively small number of stunning pictures in the Pictorialist tradition around the turn of the century, and later became one of the pioneers of the movement toward Modernism. His compositions often incorporate an object in the foreground, disrupting our view and breaking up the image. He also experimented with close ups, cropped framing, and odd camera angles (bird's eye, worm's eye etc. ), creating images that were wholly unlike the soft-focus painterly banality often associated with Pictorialism. Hints of Cubism and Surrealism also come through in certain pictures. This book is extremely helpful in putting Dubreuil into a larger historical context. It also gathers together a wider assortment of work than I have seen anywhere else, thereby providing a deeper view into his artistic approach across his career. I think I now understand better why some collectors are paying big prices for his images: many are spectacular stand alone compositions and his work (like that of Strand and Stieglitz) provides an important bridge/transition between two distinct periods in the medium's history. Collector’s POV: The only gallery I could find with inventory of Dubreuil's work was Galerie zur Stockeregg (here). His prints have come up at auction more frequently in recent years, but there are still very few available. Prices have ranged from $30000 to well over $200000. Transit Hub: While we normally provide some additional links for further study in this section, I was unable to find any meaningful articles about Dubreuil on the web. There are a few auction listings and simple bios, but surprisingly not much of substance. If readers know of interesting sources on Dubreuil, add them in the comments. With Charlotte Cotton's departure to join the National Media Museum in the UK (here), the Photography department at LACMA was suddenly headless. Last week, LACMA announced that Britt Salvesen, currently the director and chief curator of the Center for Creative Photography at the University of Arizona in Tuscon (here), will be taking over in October. While the CCP is clearly one of the top photography institutions in the world (both in terms of collections and exhibitions), the lure of the large stage of Los Angeles must clearly have played a role in Salvesen's choice. What is perhaps most surprising is that she is taking over not only the Photographs department, but also Prints and Drawings. LACMA has gone out of its way to say that the two departments will not be merged, but this seems like an exercise in creative spin. Given that both of the existing curators of the two departments have left, and are being replaced by a single person, even if the departments are run as parallel stand alone units (separate staffs and budgets etc. ), each department is now receiving only half as much top level curatorial attention as it once was (i.e. there are now two empty boxes in the org chart with one filled box above). So while Salvesen is an excellent hire, it's sad to see that an institution as important in the American art world as LACMA can't seem to afford a full time department head for photography. That said, a new hire is always a time for fresh ideas and optimism, so we'll reserve our judgment until we see the results on the ground. I was recently killing some time in the main waiting room at the Westchester County/White Plains airport. In this area, nearly every surface is covered with advertising, but it was hard to miss the huge IBM ads (one shown at right) pasted to the pillars. As I sat there amidst the crowd, I kept looking back and thinking I had seen the image someplace before. While there was no image credit anywhere on the ad, it finally dawned on me that this was a Chris Jordan photograph, repurposed in a commercial context. Chris Jordan (artist website here) makes mural sized images that depict mass culture and consumerism in the form of highly dense pictures of repeated forms. He has made images of water bottles, cell phones, cigarettes, packing peanuts, oil drums and plastic bags (among many other items). His work is represented by Kopeikin Gallery (here). The aim of this post is not to review Jordan's work, but to consider the questions of fine art photographers allowing their work to be used for advertising. As I waited for my plane, I couldn't help thinking about what my reaction to the ad would have been if I owned the same image and had it hanging in my home (for the record, we do not own any work by the artist, so this is a hypothetical exercise). By the way, it is called Light Bulbs, was made in 2008, and is normally printed 72x96, not vertical as is the case for the ad. It depicts approximately 320,000 bulbs (unless the image was cropped for the ad), the equivalent of the number of kilowatt hours of electricity wasted in the US every minute from inefficient residential electricity. It delivers its message about the need for change in how we use energy very effectively. On one hand, the ad exposes Jordan's work (and viewpoint) to a much wider audience than might normally see it in a gallery or museum. Many, many more people will see the picture as a result of this ad (thousands pass through this particular waiting room each day, and it is likely plastered in many other waiting rooms just like it in other cities), some of whom might be struck enough by the image to track down who the artists was, indirectly leading to more demand for Jordan's work. If we already owned the work, perhaps it would increase in value or we could secretly feel good about ourselves as people who saw the trend early. On the other hand, it may be the case that the ad will be more recognized than the image itself. 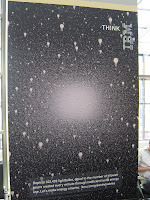 Perhaps people will now visit our home and say, "isn't that from an IBM ad?" (I will wearily nod yes), or maybe I will continually think this myself as I see it each day, forever stuck in an annoying visual rut. Overexposure may dull its potency. A harsh way to characterize this ad is that it is a sell out. Perhaps a more realistic view is that it is a way to generate some additional revenue for Jordan from work that already exists, and virtually all artists could use some more cash flow. IBM is a solid brand to be associated with, and increased exposure is generally a good thing for an artist early in his career; perhaps the ad will lead to other exciting opportunities for Jordan's work that wouldn't have come along otherwise. All in, such an ad is likely a net positive for Jordan; there is no right answer here, only a recognition that the step from fine art to commerce is a very short one. The Association of International Photography Art Dealers (AIPAD) (here) has announced the appointment of eight new member galleries. To qualify for membership, galleries need to meet a series of straightforward (and pretty obvious) ethics and integrity criteria, show they have been in the primary business of selling/promoting high quality work for at least five years, and get five current members to act as sponsors. Amador Gallery (here), New York: We've begun to get to know the folks at Amador Gallery in the past couple of years and have been impressed with our interactions to date. The gallery represents a solid mix of high quality international contemporary photographers, many of whom are puzzlingly less well known in the US, like Gabriele Basilico and Osamu Kanemura. This approach is a welcome addition to the existing NY scene, deepening the visibility of many excellent photographers who haven't been in the spotlight in NY as much. Danziger Projects (here), New York: James Danziger has been in the gallery business for nearly twenty years, and his project space combines a mix of established names and newcomers. He also writes a terrific blog (here). Rick Wester Fine Art (here), New York: Rick Wester has spent much of his career in and around the photography auction world (with Christie's and Phillips). He is now providing a variety of services from artist representation and advising private collectors/corporations, to secondary market sales and appraisals. Given the current economic climate, it's great to see new members being added to AIPAD; they'll offset those members that close up shop or transition to being private dealers/advisers, and add some fresh energy to the organization. Earlier this spring, Robert Mann Gallery announced it was leaving Chelsea and moving to the Upper East Side, with a plan to open in a new space this fall (here). In recent discussions with the gallery, we've learned that they've decided to stay at 210 Eleventh Avenue after all (here). Given the churn in Chelsea gallery space, I'm sure the landlord was keen to keep Mann in the building and looks to have made a last minute save. There are certainly lots of positives to staying in the same building: eliminating the relocation costs, no client confusion, connections with existing art tenants and the like. The gallery is currently remodeling and will reopen in September in a slightly scaled down space. A good looking Robert Frank show is scheduled for the debut. Our one year anniversary will occur next week, so I thought this would be a good time to take stock of what we’ve accomplished in our first year of writing about collecting photography. Since you are all stakeholders in the success of this venture, I thought I would provide a transparent view of the actual statistical data that we’ve collected along the way. I think it provides a good snapshot of what has happened, showing both the strengths and weaknesses of our performance. I think this data shows that we’ve done a solid job of covering the things we think collectors care about. I believe the auction coverage has been pretty comprehensive. Books have been a mixed bag; there are so many books to talk about and we are constantly discovering books that were published years ago but that are new to us. I think we will try to be a bit more current in our book reviews in the coming year. As for exhibits and shows, I think we’ve covered most of what was important, but I’d like to expand our coverage even more to get out on the fringes even further. I’d also like to add more reviews from non New York locales, perhaps from guest commentators. I’d also like to do better coverage of fairs and festivals around the world, even if we’re not attending ourselves. We began our efforts from a standing start last August (no subscribers and no visitors) with an introductory email to about 30 people. The first six months were very slow; at the end of January, we had approximately 55 subscribers and another 35 or so daily visitors. The past six months has seen a more rapid, accelerating growth in our subscriber and visitor base. If you try to strip out the double counting of repeat visits and visits by subscribers, I’d say we have a consistent daily reach of about 400 people at this point. I know from discussions with specific people that we have a strong representation of collectors, gallery owners and staff, museum curators, auction house specialists, press/critics, and artists/photographers among our consistent readership. But we’re still very, very small. I’d like to say a few words of thanks to the many folks who have linked to us and shared their readers with us. Aside from the sharing of posts via Facebook, Twitter and the like by our own readers (which is becoming more active), Conscientious (here) has been far and away our biggest supporter in terms of visitors directed to our site. Others who have consistently brought us readers via repeatedly linking to us or putting us in their blogrolls include Gallery Hopper (here), Exposure Compensation (here), Edward Winkleman (here), Amy Stein (here), Modern Art Obsession (here), and Eyecurious (here); sincere thanks to everyone who has linked to us (listed above and not), regardless of how many readers we received as a result; the link is what matters, as it shows we have earned your confidence in recommending us. One of the statistics I watch most closely is page views per visit. We have been hovering around 1.8 for most of the life of the site, and I’d like to find a way to get it up above 2. This statistic is I think a gauge of whether visitors are simply coming for a single post, or are being enticed to dig around and find other items of interest. Many, many visitors arrive via a Google search, read the post they were linked to and leave. But quite a few others visit and spend 5, 10, 15, or 30 minutes exploring. I’d like to find more ways to encourage this branching out behavior. The average visit length is another indicator of readers getting engaged with the content. It’s been steadily rising through the life of the site. This stat is a little misleading however, as it doesn’t capture the behavior of feed readers who see the content in their readers, not on the blog itself; so we really don’t know how long our entire audience is spending with us. I’m also amazed to see that we have had visitors from so many countries. While the majority of our traffic is coming from the United States, I’m pleased to see that we have a strong contingent of other nationalities that are consistently represented: the UK, Canada, France, Germany, the Netherlands, China, Japan, Italy, Australia, and Spain routinely make up our top ten. All in all, it’s been a terrific year, and we feel like we have learned an enormous amount about the world of photography by forcing ourselves to write something each day of the work week. We’re excited about the progress we’ve made with the site and look forward to Year 2 and expanding our efforts in multiple directions. As always, your comments will help us focus our attention on the right things. With that, we’re going to take a much needed vacation. Starting now, there will be no new posts until Monday, August 17th. Think of it as a time to dig through the archives. Another way to think about this hiatus is that it is similar to a public radio membership drive; the content you want is annoyingly not available, replaced by entreaties to contribute your support. But our effort is decidedly old school. We don’t want your money, nor do we want your volunteer time. Here’s what we’d like you to do, if you feel in the mood for giving. Spend 30 seconds thinking of the people you know that are the most passionate about photography: perhaps they are collectors, museum trustees, accession committee members, curators, gallery owners, or artists. Then think about which of these people is least likely to be a reader of this blog: perhaps they are extremely busy, or powerful, or don’t use the Internet much. Now choose ONE. Not 500 of your closest Facebook friends or 1000 of your Twitter followers. ONE. Spend the next 30 seconds writing this person a 3 to 4 sentence email introducing them to DLK COLLECTION (don’t forget the link! ), telling them why you read this blog regularly and what you find of value. Press send. You’re done. You’ve earned guilt free reading for an entire year, with little effort and no downside. In my view, the world of photography collecting is a very small place. Earlier this week, we made an argument that there might be 10000 collectors in total around the world. If we add in all the museum curators and staff, gallery owners and staff, art critics and press, book publishers, fair organizers, and serious artists/ photographers, perhaps we can double the number to 20000. Our site is aimed at this narrow group of people. Our goal is to get more and more of you as subscribers or regular readers; whether the general population of causal photo enthusiasts comes for a visit from time to time is much less important. I like to think of our current reader base as the “pioneers”. You read our site when it wasn’t obvious, when we made daily mistakes and worked to figure out what we were really doing. You have endured the hardships of typos, bad grammar, and ideas that missed the mark. But I’d like to think we’ve ironed out many of those kinks at this point, and that we’re getting better with age. It’s time for you to be the tastemakers that you are, and tell the more conservative “settlers” that’s it really pretty safe out here. Each one of the people you connect to with your emails deepens our reach, and if we could conceivably convert them to regular readers, we’d double our subscriber base, adding just those people who fit our narrow slice of the world, making the whole community that much stronger. The more connected our collecting community gets, the more interesting the discussions can become. Thanks once again to everyone for your amazing support, past, present, and future, and we’ll see you again, rested and refreshed, later this month. I've been meaning to do an update on all the changes over at the Joy of Giving Something (here) and the Forward Thinking Museum (here), and the summer lull is the perfect time to catch up on their activities. As a reminder, JGS is the philanthropic non-profit organization that houses the private collection of Howard Stein. Aside from the more than 10000 photographs in the collection (all online, found here), the foundation supports traveling and local exhibitions, funds artist books, publishes its own journal (Witness), and runs juried contests. I think it is perhaps the best example of what happens "after collecting", when the hunting and gathering of individual images becomes routine and the collector wants to get more involved in actively and personally supporting the community. Keep your eyes peeled for the JGS logo when you're out at museum exhibitions, reading books or attending fund raisers; the foundation is a consistent, low key supporter of a lot of what is going on in photography. The Forward Thinking Museum is another of JGS' many projects, an online experiment in museum building. The newest iteration of the museum has left behind some its more original quirks and streamlined the viewing process a bit. Gone are the Japanese museum guide, the elevator, the hand held assistant, and the hot dog stand; the museum is now a more straightforward place, and much easier to navigate quickly. Overall, the Forward Thinking Museum has plenty of top tier photography to entice viewers of all kinds. It's open all the time, there are no crowds, and it's free. For those of you out there starved for some photography excitement in the doldrums of the summer, this is a terrific place to find it. Comments/Context: Joe Deal has been on my hit list for quite a while now. He's one of those photographers that I felt like I needed to know more about, even though he wasn't exactly a household name. 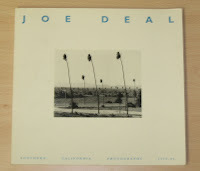 Deal was of course part of the now landmark New Topographics: Photographs of a Man-Altered Landscape exhibit at the George Eastman House in 1975, along with other notable photographers Robert Adams, Lewis Baltz, Bernd and Hilla Becher, and Stephen Shore. At least for us, of this group, Deal has always been the most elusive; there just seem to be less of his books and prints running around in the circles in which we travel, less discussion of his work in the press and among collectors we know. I've actually been thwarted at least twice in trying to acquire this book; Internet booksellers who thought they had it on the shelf and had it listed in in their database somehow didn't actually have it when our order came in. Only recently have I successfully got my hands on a copy. I'm happy to report that it was thoroughly worth the wait, and I now feel like I have a much better understanding of why he was included in New Topographics in the first place, and how his perspective is distinct from the others who also took on the subject matter of suburbanization at that time. In my view, Deal's images are mostly about the process of human settlement, about the underlying land and how we have built our lives upon it. They chronicle our occupation of the land, the tensions between the land and our chosen way of life, and the process of socialization and division that we impose upon our cities and communities as we create them. What I found most surprising in seeing a larger group of his work together in book form is that his viewpoint seems much less ominous and scolding than Baltz or Adams; his focus on the instabilities or ironies of our lives is subtler, perhaps bit less obviously judgmental. The book is divided into three sections: The Natural Environment, The City, and The City's Edge, with work from several different projects getting rolled up under each of the headings. The images from The Natural Environment are primarily of the unique geography of Southern California: rocky hillsides, scrub brush, sand, wild scraggly trees and tangled bushes. In most of the pictures, an intrusion in the form of a dirt road or other human presence in the distance disturbs the otherwise pristine view of the untamed wilderness; we're clearly encroaching on the natural environment, and doing it in a way that detracts from its rugged beauty. If there is any nature at all in the images in the section entitled The City, it was likely put there by someone. There are images of downtown construction projects, as well as of beach communities. There is a terrific sequence of images in this group that brings home the nature of our relationship to the natural world: a concrete patio overlooking the ocean, followed by synchronized swimmers in a suburban pool, followed by a lone man lying on the beach in the blinding sun, followed by families watching the twisting plastic forms of water slides, followed by trailers parked edge to edge along the coastline. The land has been domesticated for our entertainment and recreation (or so it seems). The most powerful of the images in this book are the ones in The City's Edge. Here Deal has focused on single family suburban homes (and their occupants), built in planned communities and neighborhoods, backing up to the bone dry desert. Often the images peer into deserted back yards, where the formal perfection of the front yard is gone, where sun beaten lawn furniture, abandoned toys and trash cans take center stage. At one level, there is an amazing futility in these pictures, a ridiculousness found in watering a patch of lawn under the punishing sun, or sitting on a chaise amidst the dirt. And yet, the kids are flying a kite or playing happily in a plastic pool in the driveway, and there is some sense that these people have found a degree of happiness in having a place of their own, even if it is in this inhospitable and likely unsustainable environment. This is what I mean about how Deal has approached his subjects. These suburban tract homes were an easy target; it would have been relatively straightforward to make them look ugly (and he does this to some extent). Deal has however found a way to make the point about the inherent problems with this kind of development, and the need to build communities that are in better balance with their natural environment, but he's done so without the overt harshness and lecturing that turns people away. He's left in some of the optimism that got us into trouble in the first place; the feeling that we can remake this world into a place that fulfills our dreams. He's just pulled back the curtain to remind us that this new life, on this stange land, is not turning out quite how we had envisioned. 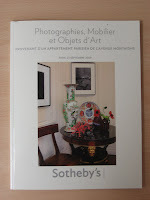 This is a fine monograph of an often overlooked photographer, well worth adding to your library. Collector’s POV: Joe Deal is represented by Robert Mann Gallery in New York (here). Very few prints by Deal have found there way into the secondary markets in recent years; those that have come up for sale have ranged in price between $1000 and $4000. Comments/Context: Many collectors will recognize the work of German photographer Peter Keetman by one of his signature projects: his images of water and oil droplets, or perhaps his work documenting a Volkswagen factory in the early 1950s. Along with Otto Steinert, Toni Schneiders, Ludwig Windstosser, Siegfried Lauterwasser and others, Keetman was part of a group called Fotoform, who pursued an approach to image making called Subjektive Fotographie (or "subjective photography"), in reaction to the Neue Sachlichkeit (or "new objectivity") movement of Renger-Patzsch, Blossfeldt and others from the 1920s. These photographers were looking for a more moderate form of Modernism, a return to humanism after decades of cool detachment. While we already own the Volkswagenwerk 1953 book (linked below), we have had a hard time finding a more comprehensive monograph of Keetman's work. So when we recently came across this volume buried in the stacks at the Strand, we knew we had to have it, even though all the essays are in German. In general, Keetman's works have strong qualities of simple abstraction: geometries, patterns and repetitions that anchor the compositions, even when they have natural forms or everyday situations as their subject matter. Plowed fields, rooftops, construction sites, water droplets, waves, and molded steel car hoods all become carefully controlled exercises in the arrangement of sinuous lines. We particularly like his multiple exposure images, many of which capture the frenetic motion and energy of city life (there is an amazing multiple image of windows and scaffolding in this book, entitled 2 mal 1 1/2, from 1959, that we had never seen before). For some reason, Keetman and his contemporaries seem to have been bypassed by many vintage collectors. Perhaps this is because they are less well known here in the United States, or maybe it is their transitional, in between placement, sandwiched just after Callahan and Siskind but before the New Topographics. 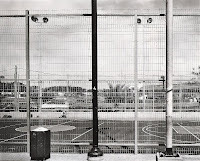 I think the photography from this movement (and Keetman's images more specifically) makes an intriguing connection between the ID Chicago school and someone like Kertesz. There were many approaches to reworking and manipulating Modernism in new ways during this period, and adding the voices of these 1950s German photographers adds color to this conversation. 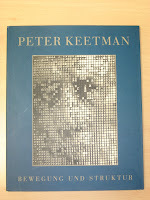 In any case, this book is an excellent reminder of Keetman's consistency over the decades. Pick up a copy if you can find one to see a broader sample of his output. Collector’s POV: It is not at all clear to us who might represent the estate of Peter Keetman. Both Howard Greenberg Gallery in New York (here) and Galerie Kicken Berlin (here) carry some inventory of his work. Luckily, Keetman's vintage prints regularly come up for sale at the German auction houses, generally finding buyers in a range between $2000 and $8000, with most near the lower end of that range, so it's quite easy to find a solid example of his work in the secondary markets. We already have one Peter Keetman image in our collection (here) and can absolutely imagine adding others in the future. How Many Photography Collectors Are There? I have often wondered about how many photography collectors there really are all over the world if you were to try and count them all up. When asked, no one seems to have any kind of definitive answer, and many folks are secretive about the information they do have. So I recently decided to try and make a back of the envelope calculation of this elusive number. I began this quest with a few high level numbers that I had gathered from various public sources, and then tried to narrow them down to represent the world of collectors. With a gross estimate in hand, I then sent out some inquiries to a wide variety of sources that might have some insight into the answer, based on their activities in the photography business, and asked them to add their thoughts to the range I provided, or to point me up or down if they preferred to keep their data private. Of course, finding an answer to this question depends significantly on how you define the word “collector”, and different members of the food chain define it differently, often depending on the kinds of collectors being targeted. While this whole exercise is a collection of assumptions and estimations, I’ve tried to focus the analysis using the following two definitions of collector: a person who is comfortable spending $1000+ (or $5000+) on photography in a single calendar year. Depending on which spending level you choose, quite different total numbers will pop out. So let’s begin with photography fair attendance numbers. All of the estimates coming up are made with a mind to make the numbers as large as possible, to estimate on the outer edge of what the number might really be. I’ve got three data points from the most recent versions of each fair: AIPAD New York 2009: 8000 visitors, Paris Photo 2008: 35000 visitors, Les Rencontres D’Arles 2008: 60000 visitors. AIPAD is I believe a collector heavy show. So while there are clearly curators, professionals, artists, press and general photo enthusiasts in the crowd, a good portion are real buyers. My estimate is approximately half might fit into the $5000+ category (4000 people), and perhaps three quarters in the $1000+ group (6000 people). The two shows in France have a much larger portion of local photo enthusiasts in the crowd. For Paris Photo, let’s go with as much as 15% of the attendees in the $5000+ group (5250 people), and 25% in the $1000+ group (8750 people). Since Arles is mostly expositions, the percentages need to be even lower: at most 10% for the $5000+ crowd (6000 people) and 15% for the $1000+ crowd (9000 people). Let’s match this against some magazine numbers. Artforum has a paid circulation of approximately 60000. My guess is that optimistically 10% of these people (6000) could be photography collectors of some kind, most likely in the top price range. Aperture has a subscriber base of 24000. I think as many as a quarter (25%) of these people could be in the $5000+ collector group (6000 people), perhaps as many as half (50%) in the $1000+ group (12000 people). So where do these first numbers leave us? If we take the average for each, we get 5450 on the top and 8350 for the broader group. Call it 6000 and 9000 for aggressive roundness. As I mentioned above, I then sent out some emails to various photography businesses that have collector client lists, and I tried to pick folks that don’t have obviously overlapping customers (i.e contemporary versus vintage). For the sake of privacy, I will not mention any of them by name or even group type, but suffice it to say, each of these businesses has a list of collectors that they contact frequently. I anchored them higher, with a total range of 8000 to 10000, without any price definitions, and asked them to comment. The general and consistent impression from this diverse group was that 8000 to 10000 was too high, perhaps meaningfully so. Some highlighted that a much smaller number are active, repeat buyers and that these folks are the bread and butter of the market. Some mentioned the layering of buyers, and found it hard to quantify the lower priced collectors, which there are clearly many more of, but no one really knows how many more (nor do they know how to contact or service them it seems). Several pointed to less than 5000 as about the right range for the number of more active collectors. Given all the data above, my conclusion from this non-scientific, assumption-heavy analysis is that there are at most 5000 active collectors who spend meaningful amounts of money on photography on an annual basis. I think we can also conclude that there are likely another 5000 or so collectors who are less active and commit fewer dollars each year. All in, 10000 total collectors is the biggest number we can defend with any meaningful credibility, and even that number might be a stretch. Please feel free to add your own data or question our assumptions in the comments, as we'd like to refine the numbers if we can get some additional solid inputs. Questions for another day (and without obvious answers) include what percentage of these collectors are using the Internet in their collecting activities, how many regularly read blogs, visit artist sites or use social networking tools, and how we can encourage more of them to become involved in what we are doing here. Comments/Context: Patrice Lumumba was the first elected Prime Minister of the Democratic Republic of Congo after it gained its independence from Belgium in 1960. Only a few months later, he was deposed in a coup and assassinated, but his nationalist dreams have lived on a number of African states, where his name adorns streets, buildings, and other monuments. South African photographer Guy Tillim has been documenting the complex environment of post-colonial Africa for more than two decades, successfully bridging the worlds of photojournalism and fine art. This recent body of work focuses on the everyday life in a handful of African nations, as embodied by the decaying Modernist buildings left over from the late colonial times and their reuse by the current population. What were once optimistic, clean lined concrete boxes, with geometric patterns and fancy grillwork, are now aging administration buildings and apartment blocks, covered in water damage and pollution stains, peeling paint, broken windows and rotting concrete. Stunted trees and weed strewn scrub are all that remain of the tidy landscapes; roadways are cracked and unmaintained. Toppled and beheaded statues lie forgotten in empty courtyards. Hotel swimming pools are overgrown and abandoned. Laundry flutters from Modernist adornments. Inside, shadowy bare rooms have become simple offices with cast off, mismatched furniture, workers processing paperwork using antique typewriters and rubber stamps; papers and files have been stacked in mountains. The colors are muted and washed out, the action slow and deliberate. People are seen from back, gazing out of upper floor windows. Bright, pure light floods into the worn rooms and buildings. Simple surfaces like the dented top of a wooden desk or the chipped layers of paint on the edge of a door frame have become stories of their own. These images are full of contrasts and juxtapositions, of what might have been and what has actually transpired. While it might be easy to see these images as discouraging or depressing, there is a quality of grace that Tillim has found amidst the rubble that makes these images rise into something altogether more poetic. The ravages of time are certainly in evidence, as are the hopes that didn't come true and the plans that didn't quite work out. In the end, these are quiet, contemplative pictures that powerfully chronicle what happens when the bright future doesn't actually take place. Collector’s POV: Guy Tillim is represented by Michael Stevenson Gallery in Cape Town (here). 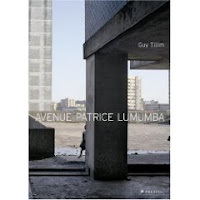 Tillim's work has not yet found its way into the secondary markets in any volume, so gallery retail will be the best/only option for follow up in the short term. I think I first saw this body of work at Michael Stevenson's booth at the Armory earlier this year. Seeing it again in book form has increased my appreciation for the images; it's a terrific book and I think the meditative story is much fuller and more resonant when seen across a wider group of pictures. I recently received an email from a gallery owner and friend who noticed that we had added a sponsorship banner to our sidebar. His view was that this sponsorship compromises our position as an objective resource. This is a fair comment, and in some ways, I have been waiting for this issue to surface. So I thought that I would post my answer(s) here rather than simply send back a private reply. We started this site just under a year ago with the goal of adding the voice of the collector to the discussion of fine art photography. We wanted to create place where we as collectors could speak in our own language and focus on our own priorities, where we could talk about auctions, and prices, and gallery shows, and emerging photographers, without the overhead of the spin and salesmanship that we are all constantly bombarded with. We wanted to share our unvarnished opinions of the work we came across and be exposed to the opinions and knowledge of others, leveraging their expertise to increase our knowledge. We are constantly trying to think of ways to make the site more useful and relevant for collectors, and regular readers know that we have experimented with lots of different things, many of which have fizzled out and disappeared. Earlier this summer, we decided that it might be interesting to do an experiment with a banner sponsorship from a gallery, mostly to try and understand our readership better and see whether our readers would click through to visit the gallery that was presented. Part of the reason I enjoy reading Artforum is the ads; of course I read the articles and regular content as well, but the ads provide a flavor for what’s going on, a reminder of things I might have forgotten, and often a new direction to explore. As collectors ourselves, we know that we are always looking for new galleries to visit and work with that are led by good people, that have unexpected high quality inventory, and that are fair in their dealings with potential buyers. If we came across a gallery previously unknown to us on a photography site that we respect, we would gladly click through to learn more, and if it turned out to be a good fit for us, we would appreciate that the site had led us to something of value. I hope that readers who have made it this far will have noticed that we have not made any economic argument for why we have explored this sponsorship idea; our goal with the sponsors is not to make a few bucks on the advertising. The overriding idea is to make the experience of visiting the site more valuable for our readers. My fantasy is that we might someday have a handful of small banners in the sidebar, highlighting an edited group of exciting galleries, shows, auctions, books or the like, all of which would be of interest to photography collectors worldwide, thereby making the site more relevant to the community. The final and perhaps most important question is whether or not these sponsorships will somehow influence our approach to what we review and how we review it. My answer is that I think we have the intellectual integrity to say what we think, whoever the subject might be. We haven’t held back so far and I can’t imagine changing our approach due to the presence of a banner. I think sponsors can expect to get a critical review should the situation arise, and non-sponsors should expect to get the same critical review when we visit them. But let’s put a fine point on this discussion. Let’s assume the worst case: we have a banner up from a gallery we respect, perhaps even announcing a specific show, and then we go to see this show, and we don’t much like it. (In practice, it seems unlikely that we would accept a banner from a show that we didn’t have a decent amount of confidence would be worthwhile, but let’s leave that aside for the moment.) My guess is that it would get just what it deserves, a marginal review. And while this is a less than desirable outcome for all involved, it’s the only one that makes sense if we are going to be credible as a source of criticism for our audience of fellow collectors. While the gallery may not like it, I think most of the folks we would be dealing with would understand why took the stand we did. Of course, these are all empty words until we have a real conflict of interest of some kind and we prove to our readers that we will act with the integrity we claim. So to be clear, on a going forward basis, we plan to have opinions, be biased, and tell you what we think in unambiguous language. And if you think you discern some suspicious skew or slant in our writing, by all means, call it out publicly in the comments and we’ll address it as forthrightly as we can. Even though we do most of the talking, this is as much your forum as it is ours, and if something doesn’t smell right, then let’s get it out in the open and discuss it. It is my expectation that the good that comes from these sponsors will far outweigh the bad, and that having the support and validation of a few important players in the world of photography is a normal and necessary step in becoming a durable and valuable destination for collectors. Cindy Sherman's studio spread in Vogue (here). I'm always interested to see what is hanging on the walls of an artist's studio, especially when it's photography. There is a slide show linked at the bottom of the article, with shots of her work space, prop closets and the like. Erwin Olaf contributes some dark images of cobwebbed kitchens with rotting food to an article by Michael Pollan in the New York Times Magazine about the slow demise of cooking (here). Given the Edgar Martins fiasco, notice the extra obvious "photo illustration" captions under each image. A generally sad article in the New York Times about the deteriorating financial situation of Annie Leibovitz (here). It's an astonishing but seemingly real possibility that she could lose control of the rights to the output of her entire career. Alec Soth's new work, Black Line of Woods, done as commission for the High Museum in Atlanta, opens later this week (here) and is featured/profiled in the New York Times (here). The subject matter of this project is people who are living out in the woods, off the grid, separated from society: "monks, hermits, and survivalists" according to the article. While I haven't seen the pictures (except for the few included in the feature), I think this subject has some timely resonance, especially for those who are feeling trapped by the bad economy and the encroaching world, and are either forced to leave or are looking to "run away" and return to a simpler existence of some kind. I also liked the idea of his list of things to watch for while driving, taped to his steering wheel; it reminded me of the endless obsessive lists of things to photograph that Diane Arbus made.